This is easily the biggest, and best, garage sale to be seen at in the history of Far North Queensland. 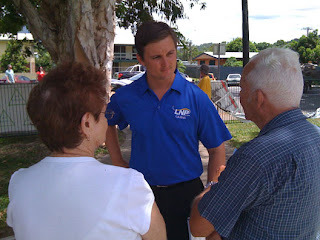 Former Cairns LNP candidate, Joel Harrop invites you over to unload your stimulus package at his place this weekend. We aren’t talking junk, good quality stuff at bargain prices. Economic models indicate my comprehensive sale will have more economic impact than the federal stimulus packages. In fact, come along with your $900 and give it to me. Economic modeling provided by Treasury has forecast that this garage sale will create 60,000 Queensland jobs over the next three years. From TVs to Dishwashers to household trinkets, kitchen appliances and baby gear, there is something for everybody... all in perfect working order. If I listed all of the bargains, your head would probably explode*! If you were to be anywhere else this weekend, you would be insane**. During the garage sale, all power will be generated through renewable energy***, with the activity achieving a negative carbon emission. Unfortunately, the ETS isn’t in place yet, so that doesn’t really help me much, but it is saving the planet. Data provided by CAFNEC forecasts a decrease in global temperature by 2c as a direct result of this garage sale****. This garage sale is a bicycle friendly activity with a spot on the front lawn specifically for pushies. Out specially designed garden hose is connected to our un-fluoridated water source, which is not part of Nullinga Dam project. However, anyone who wants water should be aware that this garage sale has a strict demand management practice in place, and mild levels of dehydration are deemed acceptable in order to save our Wild Rivers. This garage sale signed the petition to stop the destruction of the Yacht Club, and Di Forsyth actually carried a copy of this advertisement with her when she scaled the building. Throughout the conduct of the garage sale, movement corridors for cassowaries will be maintained. Furthermore, this garage sale is doing its bit to protect our bio-diversity, with a beautiful sensitive weed bloom occurring throughout the property. The Greens were going to preference this garage sale over all other garage sales, but at the end of the day preferenced Labor in 14 other garage sales. Unfortunately, not everyone supports this garage sale. Councillor Kirsten Lesina opposes it, but doesn’t know why. Syd Walker is concerned that it is sponsored by the Israeli government, and Barry Daniels believes that it is a National Party conspiracy. Whereas Stuey Traill is expected to attend the sale, but will be protesting on behalf of a Union he is not a member of. See you at 6 Tradewinds Close, Redlynch this Saturday the 4th and Sunday the 5th. Only Australian bananas will be served. *Heads may not actually explode. 6 in 10 people participating in controlled studies, including a placebo test group, suffered head explosion. None from the placebo group suffered explosive side effect. ** Actual levels of sanity may vary. A psychologist will be available on the day, but as the insane people won’t be at the sale, that isn’t really much help. *** Power provided by sun. **** CAFNEC oppose this garage sale due to it contributing to the new phenomena of global cooling.